Louise is currently in her fourth year of the Monash MBBS course. She has always had a keen interest in anaesthetics and is looking forward to undertaking her elective in this area next year in South America. Intraoperative awareness and subsequent explicit recall can lead to prolonged psychological damage in patients. There are many methods currently in place to prevent this potentially traumatic phenomenon from occurring. Such methods include identifying haemodynamic changes in the patient, monitoring volatile anaesthetic concentration, and various electroencephalographic algorithms that correlate with a particular level of consciousness. Unfortunately none of these methods are without limitations. Intraoperative awareness is defined by both consciousness and explicit memory of surgical events. There are a number of risk factors that predispose patients to such a phenomenon, both surgical and patient-related. Procedures where the anaesthetic dose is low, such as in caesarean sections, trauma and cardiac surgery, have been associated with a higher incidence. Likewise patients with low cardiac reserve or resistance to some agents are prominent attributable factors. A small number of cases are also due to a lack of anaesthetist vigilance with administration of incorrect drugs or failure to recognize equipment malfunction. Ultimately it is largely an iatrogenic complication due to administration of inadequate levels of anaesthetic drugs. Most cases of awareness are inconsequential, with patients not experiencing pain but rather having auditory recall of the experience, which is usually not distressing. In some cases, however, patients experience and recall pain, which can have disastrous, long-term consequences. Awareness has a high association with post-operative psychosomatic dysfunction, including depression and post-traumatic stress disorder,  and is a major medico-legal liability. Though the incidence of awareness is infrequent, estimated to occur in 1-2 cases per 1000 patients having general anaesthesia in developed countries,  the sequelae of experiencing such an event necessitates the development and implementation of a highly sensitive monitoring system to prevent it from occurring. Unfortunately the MAC is affected by a number of factors and thus it is difficult to determine an accurate concentration that will reliably prevent awareness. 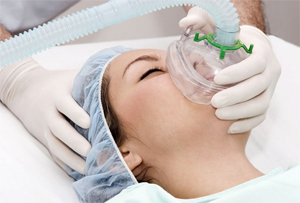 Patient age is the major determinate of the amount of inhalation anaesthesia required, as are altered physiological states such as pregnancy, anaemia, alcoholism, hypoxaemia and temperature of the patient. Most importantly, the administration of opioids and ketamine, both commonly included in the anaesthetic regimen, severely curtail the ability of the gas analyser to determine the MAC. Further, the MAC is a reflection of inhalational anaesthetic concentration, not effect. The suppression of response to noxious stimuli whilst under volatile anaesthesia is mediated largely through the spinal cord, and thus does not accurately reflect cortical function and the penetration of the anaesthetic into the brain. Another major limitation to using gas analysers is that they have limited reliability when intravenous anaesthesia is used. Simultaneous administration of intravenous anaesthetic agents is extremely common and in many cases total intravenous anaesthesia is used; in such cases the use of the MAC is not applicable. Advances in technology have lead to the concomitant development of processed encephalographic modalities and their use as parameters to assess depth of anaesthesia; the most widely used being the BIS monitor. The BIS monitor uses algorithmic analysis of a patient’s EEG to produce a single number from 1 to 100, which correlates with a particular level of consciousness. [5,14] For general anaesthesia, 40-60 is recommended. The establishment of this monitor at first seemed promising with the publication of several studies advocating its use in preventing awareness. The first of these was conducted by Ekman et al,  and indeed found that there was a substantial decrease in incidence of awareness when the BIS monitor was used. In this study, however, the patients were not randomly allocated to the control group and the BIS monitoring group, and thus the results are subject to a high degree of bias and cannot be reliably interpreted. The second study, the B-Aware trial,  also found that BIS-guided anaesthesia resulted in a reduction in awareness in high risk patients, however despite having a sound study design, subsequent studies failed to reproduce this result. One prominent study, the B-Unaware trial,  compared BIS monitoring to more traditional analysis of end-tidal concentrations of anaesthetic gases to assess depth of anaesthesia during surgeries on high risk patients. This study failed to show a significant reduction in the incidence of awareness using BIS monitoring, however a major criticism of this study is that the criteria used to classify the patients in the trial as ‘high-risk’ was less stringent than those used in the B-Aware trial which likely biased the results. Also, given the low incidence of awareness, a larger number of study subjects would be required to demonstrate any significant reduction. The BIS monitor also has several practical issues that further question its efficacy in monitoring consciousness. It is subject to electrical interference from the theatre environment, particularly from electromyography, diathermy and direct vibration. This is more likely in cases where the surgical field is near the BIS electrode (such as facial muscle surgery) which will falsely elevate BIS values, leading to possible excess administration of anaesthesia. Similar to the MAC, standard BIS scores are not applicable to all patient populations, particularly in patients with abnormal EEGs – those with dementia, head injuries, cardiac arrest and have hypo- or hyperthermia. In such cases, the BIS value may underestimate the depth of anaesthesia, leading to the administration of excess anaesthetic and a deeper level of anaesthesia than required. Further, as the molecular action of various anaesthetic agents differs, the consequent EEG changes are not uniform. Specifically, the BIS monitor cannot accurately assess changes in consciousness when the patient is administered ketamine  and nitrous oxide,  both commonly used agents. Despite these practical downfalls, however, there are substantial benefits to the BIS monitor which should be incorporated into future depth of anaesthesia monitors. The BIS monitor helps anaesthetists to titrate the correct dosage of anaesthetic for the patient,  and to adjust this accordingly throughout the surgery to keep the patient within the recommended range for general anaesthesia without administering excess agent. This results in decreased haemodynamic disturbance, faster recovery times and reduced post-operative side effects. A meta-analysis found that use of BIS monitoring significantly reduced anaesthetic consumption by 10%, reduced the incidence of nausea/vomiting by 23% and reduced time in the recovery room by four minutes. This may offer a cost-benefit as less anaesthetic will be required during surgeries. Despite the aforesaid advantages of using the MAC and BIS monitor to assess consciousness during surgery, the major inadequacy to both of these methods is that they only measure the hypnotic element of anaesthesia. Anaesthetic depth is in fact a complex construct of several components including hypnosis, analgesia, amnesia and reflex suppression. Different anaesthetic agents have varying effects across these areas; some are able to be administered independently, and others only have properties in one area, and thus must be used in conjunction with other pharmacologic agents to achieve anaesthesia. If only the hypnotic component of anaesthesia is monitored, optimal drug delivery is difficult and there is a risk that insufficient analgesia may go unnoticed. Thus the MAC and BIS monitors can be used to monitor hypnosis and sedation, but have little role in predicting the quality of analgesia or patient movement mediated by spinal reflexes. Measuring depth of anaesthesia to prevent intra-operative awareness remains a highly contentious aspect of modern anaesthesia. Current parameters for monitoring consciousness include the observation of clinical signs, the MAC and BIS indices, as well as less commonly used methods such as evoked potentials and entropy. These instruments allow clinicians to accurately titrate anaesthetic agents leading to a subsequent decrease in post-operative side effects and a reduction in awareness among patients at increased risk of this complication. Despite these benefits, all of the current monitors have limitations and there is still no completely reliable method of preventing this potentially traumatising event. What is required now is a parameter or measure that shows minimal inter-patient variability and the capacity to respond consistently to an array of anaesthetic drugs with different molecular formulations. It is important to remember, however, that no monitor can replace the role of the anaesthetist in preventing awareness. Mashour GA, Orser BA, Avidan MS. Intraoperative awareness: From neurobiology to clinical practice. Anesthesiology 2011;114(5):1218-33. Ghoneim MM, Block RI, Haffarnan M, Mathews MJ. Awareness during anaesthesia: risk factors, causes and sequelae: a review of reported cases in the literature. Anesth Analg 2009; 108:527-35. Orser BA, Mazer CD, Baker AJ. Awareness during anaesthesia. CMAJ 2008; 178:185–8. Osterman JE, Hopper J, Heran WJ, Keane TM, Van der Kolk BA. Awareness under anaesthesia and the development of posttraumatic stress disorder. Gen Hosp Psychiatry 2001; 23:198-204. Kaul HL, Bharti N. Monitoring depth of anaesthesia. Indian J. Anesth 2002;46(4):323-32. Struys MM, Jensen EW, Smith W, Smith NT, Rampil I, Dumortier FJ et al. Performance of the ARX-derived auditory evoked potential index as an indicator of anesthetic depth: a comparison with bispectral index and hemodynamic measures using propofol administration. Anesthesiology 2002;96:803-16. Bruhn J, Myles P, Sneyd R, Struys M. Depth of anaesthesia monitoring: what’s available, what’s validated and what’s next? Br J Anaesth 2006; 97:85-94. Myles PS. Prevention of awareness during anaesthesia. Best Pract Res Clin Anesthesiol 2007; 21(3):345-55. Eger EI 2nd, Saidman IJ, Brandstater B. Minimum alveolar anaesthetic concentration: a standard of anaesthetic potency. Anesthesiology 1965; 26:756-63. Eger EI 2nd, Sonner JM. How likely is awareness during anaesthesia? Anaesth Analg 2005; 100:1544. Eger EI 2nd. Age, minimum alveolar anesthetic concentration and the minimum alveolar anesthetic concentration-awake. Anesth Analg 2001;93:947-53. Nost R, Thiel-Ritter A, Scholz S, Hempelmann G, Muller M. Balanced anesthesia with remifentanil and desflurane: clinical considerations for dose adjustment in adults. J Opioid Manag 2008;4:305-9. Rampil IJ, Mason P, Singh H. Anesthetic potency (MAC) is independent of forebrain structures in the rat. Anesthesiology 1993;78:707-12. Morimoto, Y. Usefulness of electroencephalogramic monitoring during general anaesthesia. J Anaesth 2008;22:498-501. Ekman A, Lindholm ML, Lennmarken C, Sandin R. Reduction in the incidence of awareness using BIS monitoring. Acta Anaesthesiol Scand 2004;48:20-6. Myles PS, Leslie K, McNeil J, Forbes A, Chan MT. Bispectral index monitoring to prevent awareness during anaesthesia : the B-Aware randomised controlled trial. Lancet 2004;363:1757-63. Avidan M, Shang L, Burnside BA, Finkel KJ, Searleman AC, Selvidge JA et al. Anesthesia awareness and the bispectral index. N Engl J Med 2008;358:1097-1108. Morioka N, Ozaki M, Matsukawa T, Sessler D, Atarashi K, Suzuki H. Ketamine causes a paradoxical increase in the Bispectral index. Anesthesiology 1997;87:502. Puri GD. Paradoxical changes in bispectral index during nitrous oxide administration. Br J Anesth 2001;86:141-2. Sebel PS, Rampil I, Cork R, White P, Smith NT. Brull S et al. Bispectral analysis for monitoring anaesthesia – a multicentre study. Anesthesiology 1993;79:178. Liu SS. Effects of bispectral index monitoring on ambulatory anaesthesia: a meta-analysis of randomized controlled trials and a cost analysis. Anesthesiology 2004;101:591-602. Bein B. Entropy. Best Pract Res Clin Anaesthesiol 2006;20:101-9. Baulig W, Seifert B, Schmid E, Schwarz U. Comparison of spectral entropy and bispectral index electroencephalography in coronary artery bypass graft surgery. J Cardiothorac Vasc Anesth 2010;24:544-9. Gajraj RJ, Doi M, Mantzaidis H, Kenny GNC. Analysis of the EEG bispectrum, auditory evoked potentials and EEG power spectrum during repeated transitions from consciousness to unconsciousness. Br. J. Anaesth 1998;80:46-52. Thoo M. Brain monitor puts patients at ease. Swinburne Magazine 2011 Mar 17;6-7. Breeze, D. Ethics approval obtained for BAR monitor trial in Melbourne. Cortical Dynamics Ltd. 2011 Nov; 1. Orser B, Mazer C, Baker A. Awareness during anaesthesia. CMAJ 2008;178(2):185–8.